Create better containment abatement while saving time and money with our Abatement Containment Film. No more poly, tape, or spray glue! This 6 mil self-adhesive film rolls right onto your surface, isolating your workspace and creating a controlled contained environment. Great for covering criticals like doors, vents, windows, walls, floors and carpeting when removing harmful materials like asbestos, lead and mold. Self-adhesive film keeps leaks from spreading, not allowing the release of contaminates into the environment. Our wall and floor applicators reduce ladder time and greatly increase the speed and ease of creating a contained environment. Available in two types of film - Multi Surface and Carpet. Multi Surface Film can be used on floors, walls and Carpet Film has a more aggressive adhesive and is recommended for use on carpets only. Both types are easy to clean and vacuum. Wall Applicator and Floor Applicator offered to make installation even faster and easier. Easy clean-up. Sticks to floors so squeegee and vacuum can be used. Hi: Is the poly fire rated? 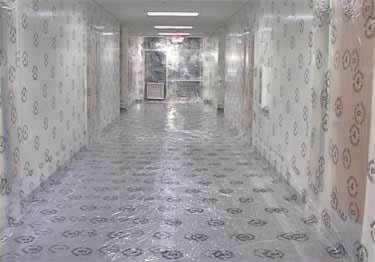 Self-Adhesive Abatement Containment Film provides improved isolation containment that is faster and easier to use than the old poly and masking tape method. Available in 48" x 200 ft rolls.